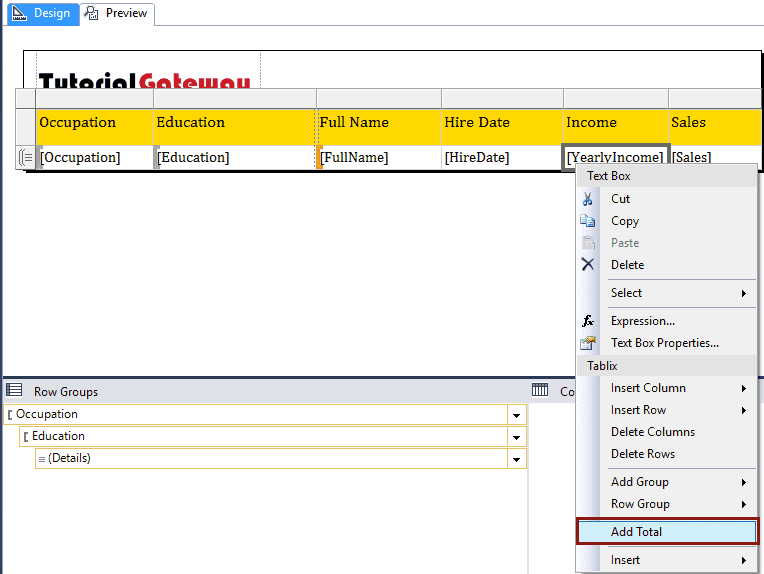 In this article, we will show you, How to Add Total and Subtotal to SSRS Report. 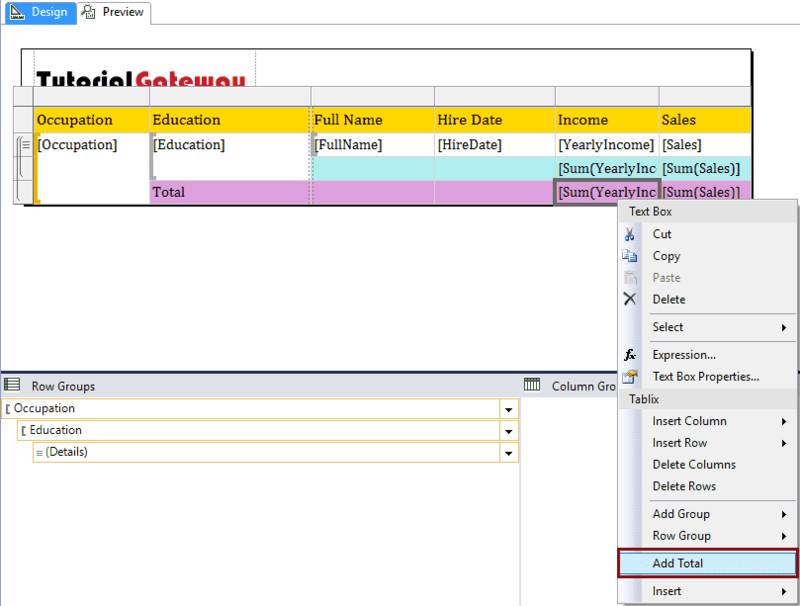 This is one of the common requirement from the Client end while you are designing the Table or a Matrix report. 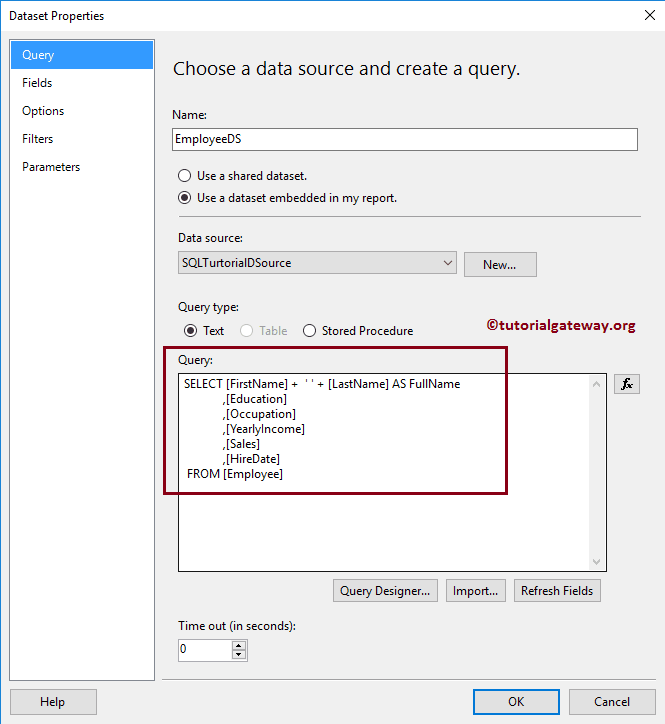 To explain the steps involved to add Total and Subtotal to SSRS Report, We are going to use below shown DataSet. Please refer to Embedded Data Source and Dataset articles to understand the steps involved in creating Embedded Data Source, and Dataset that we used for this report. 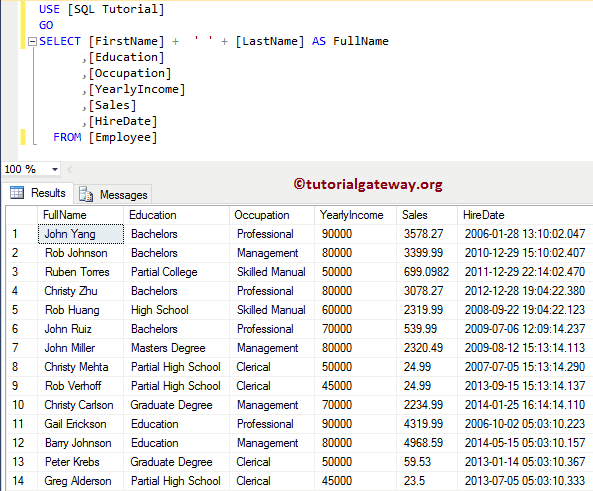 SSRS provides you two different approaches to add totals, or subtotals to the SSRS reports. In this example, we will explain one approach and later we will explain the other. To add totals, and subtotal we need a table or matrix report. We are going to use the below-shown report for this example. Let me show you the Report Preview. 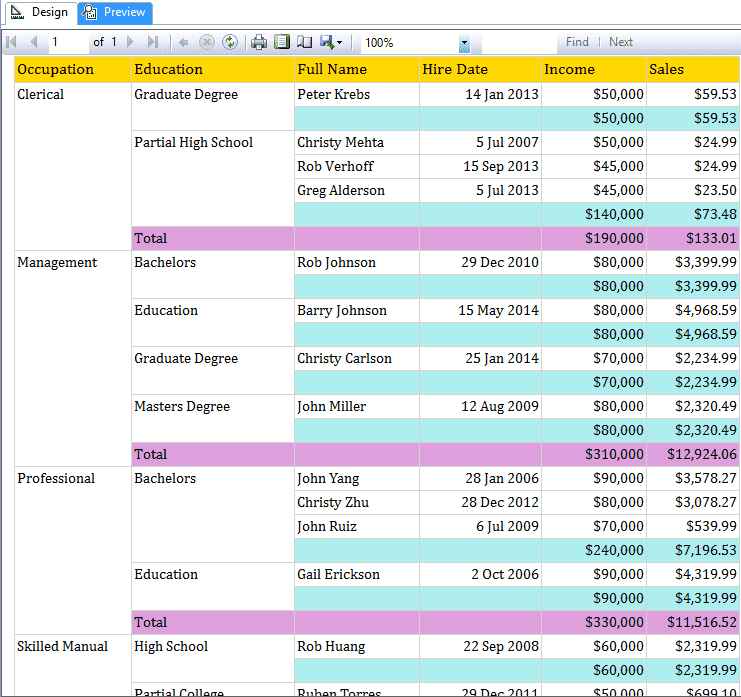 If you observe the below screenshot, it is displaying the data in three levels: Occupation is at Top Level, then Education at Second Level, and Details (Full Name, Hire date, Income, Sales) at third level. 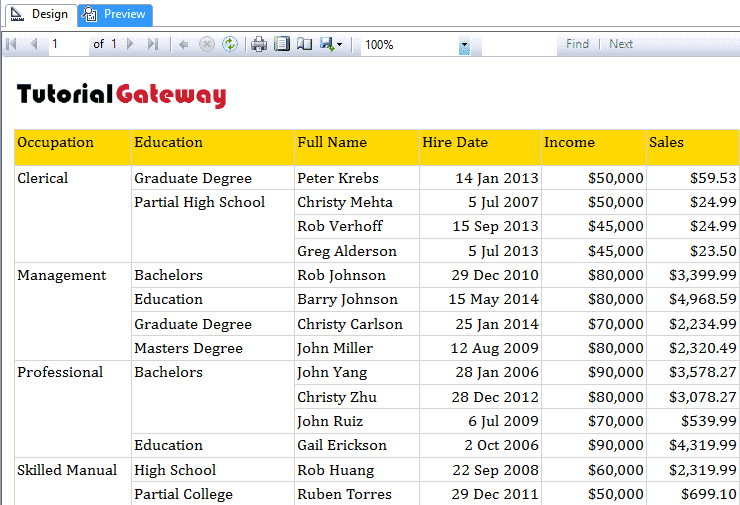 Here our task is to add Totals to Both Incomes, and Sales Column at all levels. First, we will add the Total at the Details level. 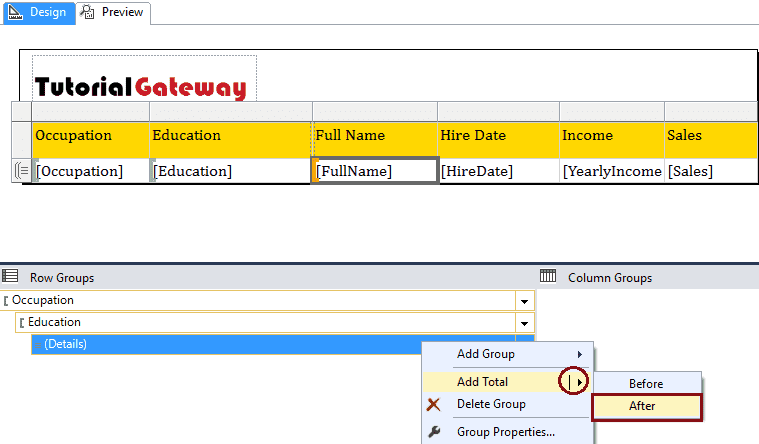 In order to do so first, goto Row Groups pane and right-click on the Details will open the context menu. Let me open the Preview tab to check the Totals at the details level. 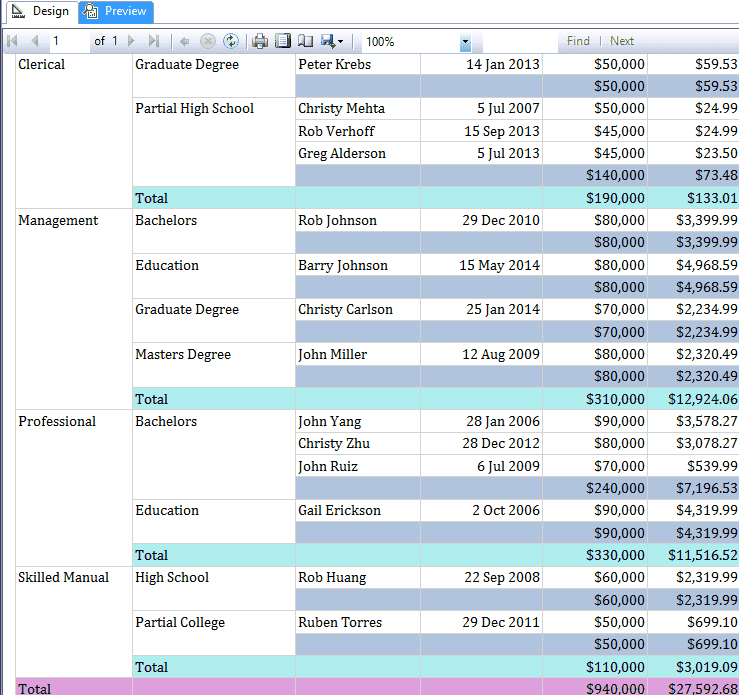 From the below screenshot you can see that an extra column is added with subtotals. Next, we will add the Total at the Education Level (Second Level). 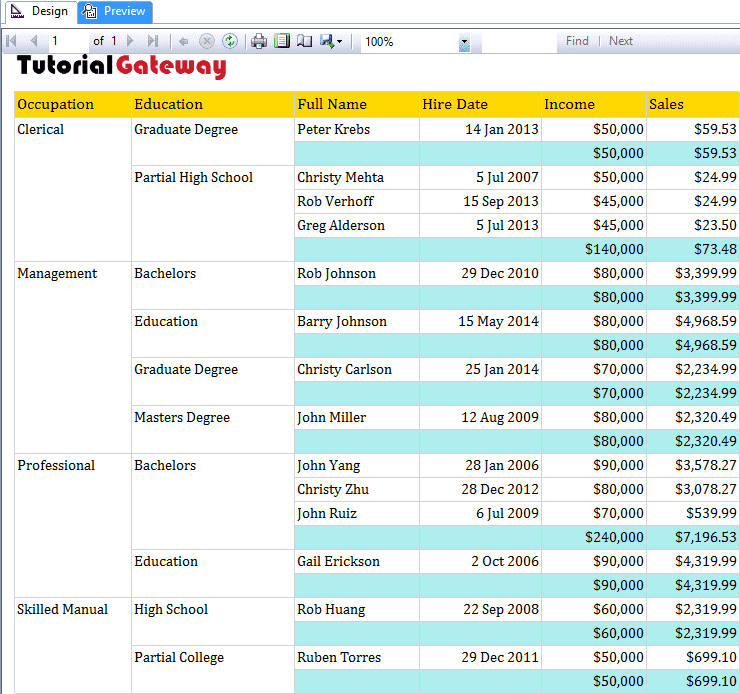 In order to do so first, goto Row Groups pane and right-click on the Education will open the context menu. Let me open the Preview tab to check the Totals at Education level. 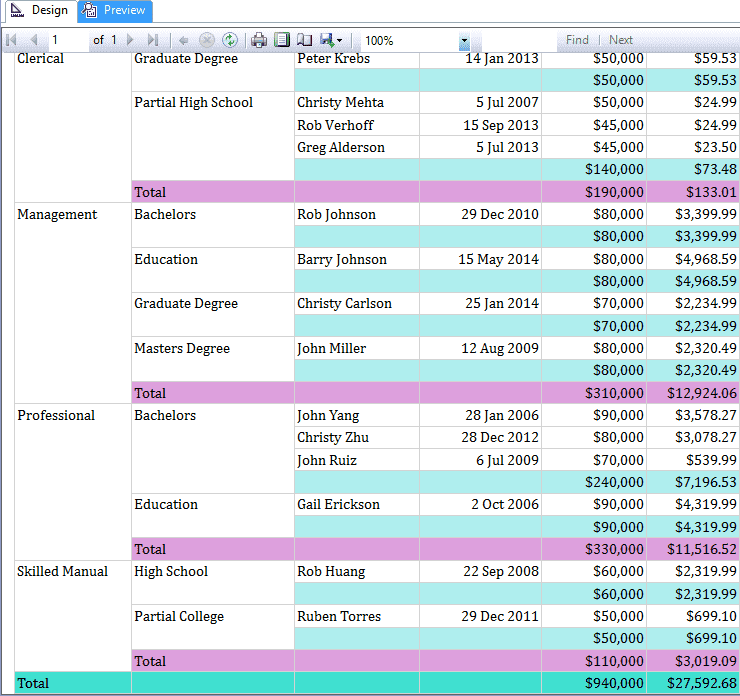 Lastly, we will add the Total at the Occupation (Top Level). 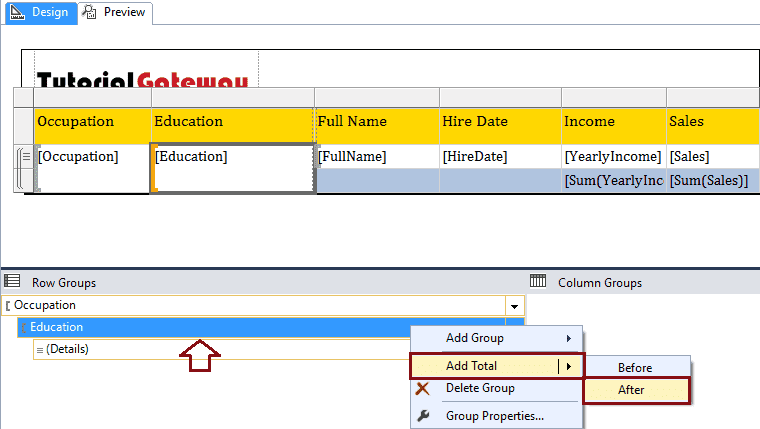 In order to do so first, goto Row Groups pane and right-click on the Occupation will open the context menu. Let me open the Preview tab to check the Grand Totals at details level. 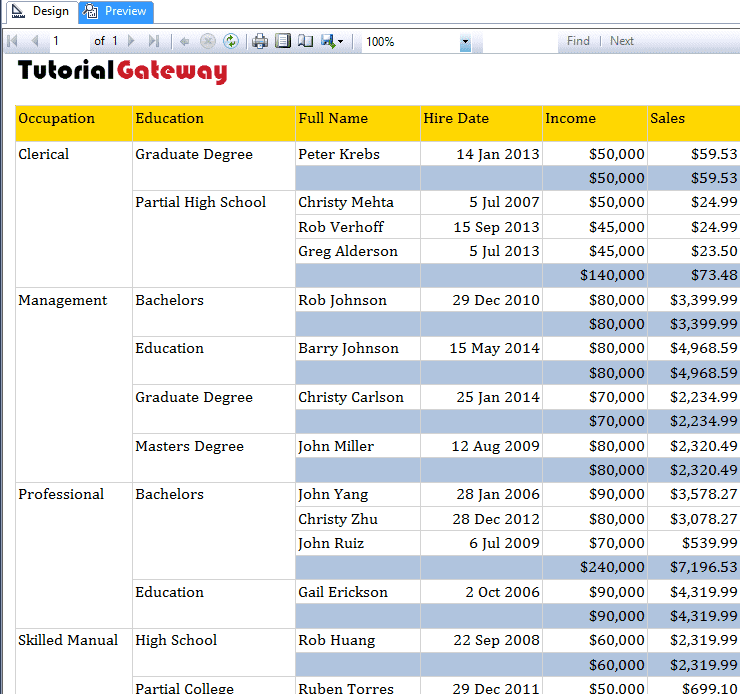 From the below screenshot you can see that an extra column is added at the End with Grand Total. First, we will add the Total at the Details level. 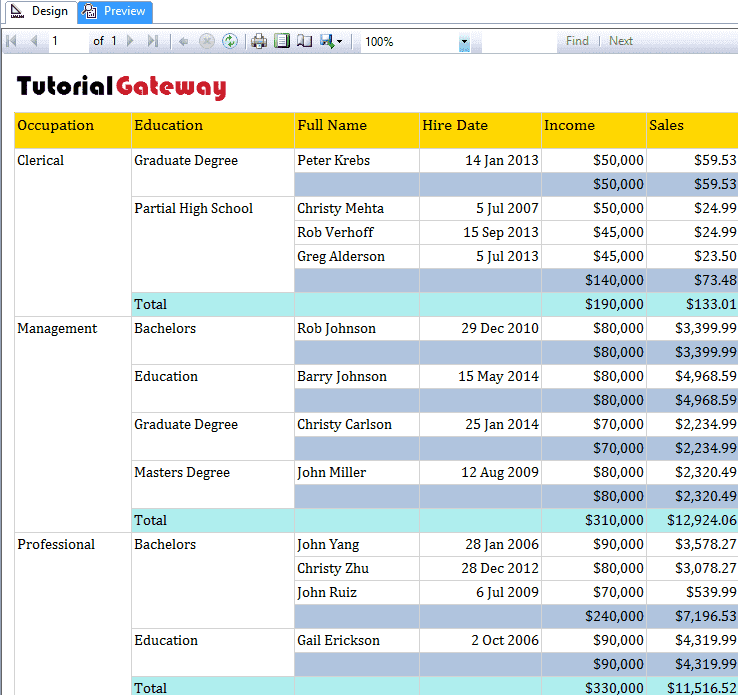 In order to do so first, goto Metric Column (Yearly Income) and right-click on it will open the context menu. Next, we will add the Total at the Education level. 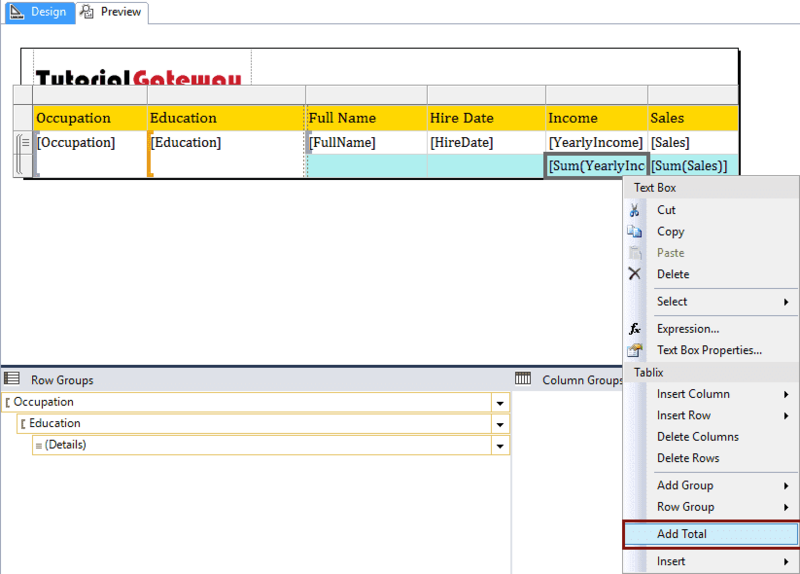 In order to do so first, goto Yearly Income Total Column (Details Total Row -> Yearly Income Column) and right-click on it will open the context menu. From the context, Please select Add Total option as shown in below screenshot. Lastly, we will add the Total at the Occupation Level, or Grand Total. 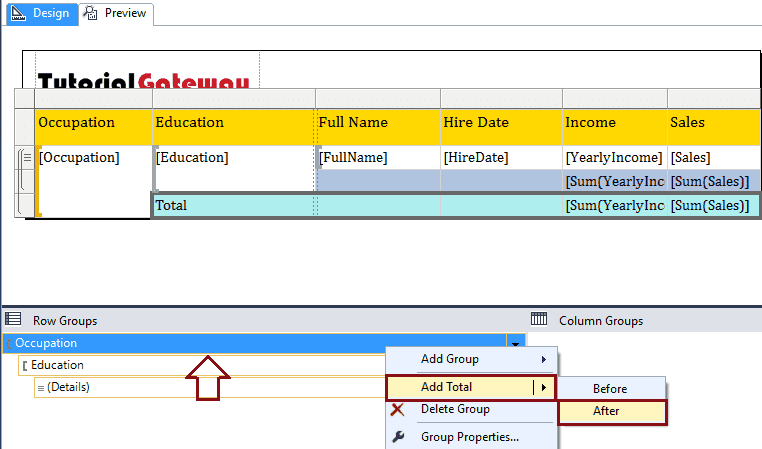 In order to do so first, goto Yearly Income Total Column (Education Level Total Row -> Yearly Income Column) and right-click on it will open the context menu. From the context, Please select Add Total option as shown in below screenshot. From the above screenshot, you can see that the second approach is also showing the Grand Total.